Since Staten Island always gets a bad rap for having few attractions, I make a concerted effort to mention the forgotten borough in these blog posts. This Sunday, September 25 from 12:30-4pm, head to Richmond County Ballpark, Home of the SI Yankees, for a FREE afternoon workout event and party. If you aren't familiar with Staten Island, the ballpark is adjacent to the Staten Island Ferry (which is free to ride). Soooo take a free cruise from lower Manhattan to Staten Island. 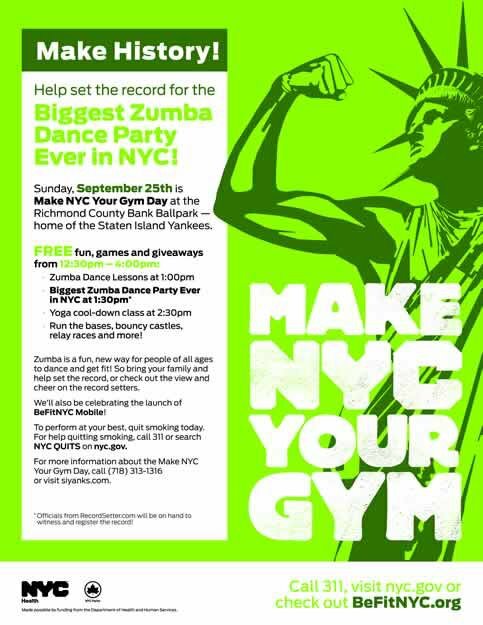 Burn off Saturday night's excessive calories with a free workout and join other participants in attempt to break a record for NYC's biggest Zumba workout. For more info, click here. Who knows, maybe you'll do something crazy and spend the whole day on Staten Island... ahhh!